The backcross breeding approach can be employed to introduce a specific trait, such as disease resistance, from one line, often an unimproved line, to another line that is typically an elite breeding line. This page provides an explanation and a visual representation of the backcrossing process and backcross populations. Backcross breeding is an effective method to transfer one or a few genes controlling a specific trait from one line into a second—usually elite—breeding line. The parent with the desired trait, called the donor parent, provides the desired trait and may not perform as well as an elite variety in other areas. The elite line, called the recurrent parent, usually performs well in all other areas. Backcrossing involves making an initial cross between the donor and recurrent parents. The resultant F1 progeny have 50% of their genetic material from each parent (Fig. 1). 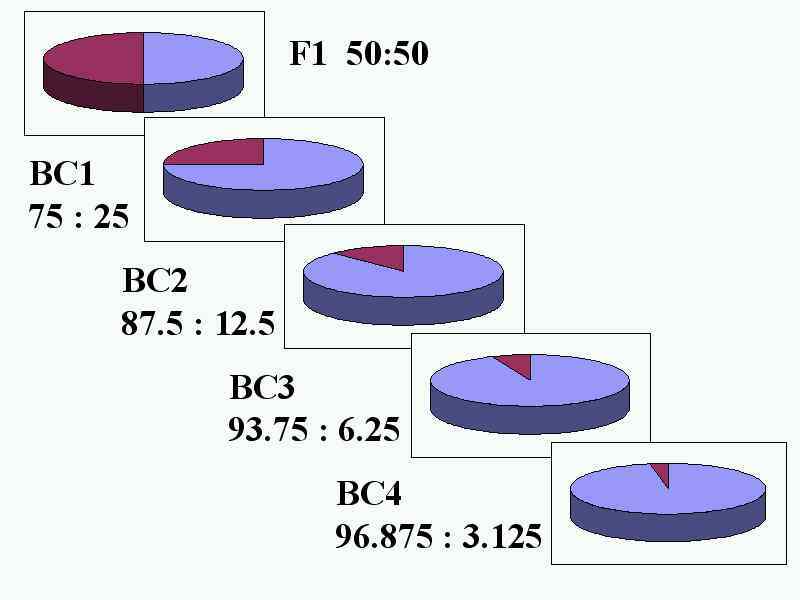 F1 individuals are crossed to the recurrent parent to develop a backcross one (BC1) population. Individuals from the BC1 population are once again crossed to the recurrent parent. Each generation of backcrossing reduces the proportion of the donor parent present in the population by half (Fig. 1). This cycle of crossing backcross progeny to the recurrent parent continues until a new line that is identical to the recurrent parent, but with the desired gene or trait from the donor parent is created. By the BC4 generation, the lines are >96% identical to the recurrent parent. The backcrossing process can often be accelerated using marker-assisted backcrossing, also known as background selection. Figure 1. The contribution of the donor parent genome is reduced by half with each generation of backcrossing. Percentages of recurrent parent (light purple) are expressed as a ratio to percentages of donor parent (dark red-purple). Image credit: David Francis, The Ohio State University. Byrne, P. and K. Richardson. 2005. Marker-assisted backcrossing for a single gene [Online lesson]. Marker-assisted selection. Plant and Soil Sciences eLibrary, University of Nebraska – Lincoln. Available at: http://plantandsoil.unl.edu/croptechnology2005/pages/index.jsp?what=topicsD&informationModuleId=1087488148&topicOrder=7&max=10&min=0& (verified 23 Sept 2010). Baenziger, P. S., and P. Hain. 2005. Advanced backcross breeding [Online lesson]. Plant and Soil Sciences eLibrary, University of Nebraska – Lincoln. Available at: http://plantandsoil.unl.edu/croptechnology2005/pages/index.jsp?what=topicsD&topicOrder=1&informationModuleId=959723462 (verified 23 Sept 2010). Hain, P., and D. Lee. 2005. Backcross breeding 1 - basic gene inheritance [Online lesson]. Plant and Soil Sciences eLibrary, University of Nebraska – Lincoln. Available at: http://plantandsoil.unl.edu/croptechnology2005/pages/index.jsp?what=topicsD&topicOrder=1&informationModuleId=957885794 (verified 23 Sept 2010). Hain, P., and D. Lee. 2005. Backcross breeding 2 - the backcrossing process [Online lesson]. Plant and Soil Sciences eLibrary, University of Nebraska – Lincoln. Available at: http://plantandsoil.unl.edu/croptechnology2005/pages/index.jsp?what=topicsD&topicOrder=1&informationModuleId=959009357 (verified 23 Sept 2010).